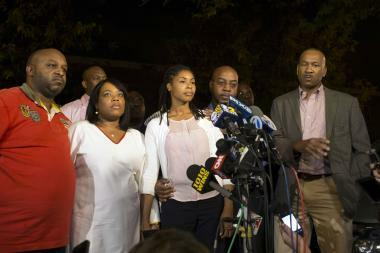 Eric Sanders (R) stands with the family of Miriam Carey while they address media outside a home in Bedford-Stuyvesant on Oct. 4, 2013. A federal judge ordered Sanders' arrest last week, saying he has refused to comply with the court's orders. NEW YORK — U.S. Marshals armed with a warrant have arrested the prominent New York lawyer who represents the family of Miriam Carey, the Connecticut woman shot and killed in Washington, D.C. after she tried to crash her car through a White House gate, DNAinfo New York has learned. Eric Sanders, a civil rights attorney best known for suing the NYPD, was arrested outside his house in Melville, L.I., Tuesday morning after Federal Bankruptcy Judge Dorothy Eisenberg issued a warrant last week. Eisenberg was furious that Sanders had flouted her authority for months — dragging his feet in court, failing to show up for hearings and ignoring her requests for documents, according to court documents. Sanders surrendered without incident, sources said. The final straw was when Sanders failed to pay $181,666 to several people who recently won settlements against him, including a lawyer in his firm who was fired because she got pregnant, according to court documents. Sanders was processed at the federal courthouse in Central Islip before being transferred to the Metropolitan Detention Center in Sunset Park, where he will remain until Judge Eisenberg chooses to see him or he clears up his debts, sources said. "He will sit there until she wants to talk to him or he pays his debt," a source said. Sanders' office did not immediately return a call for comment. The arrest came shortly after Sanders appeared with Carey's family at her wake in Brooklyn on Monday night, where he once again criticized cops and federal officers in Washington, D.C. for killing the troubled 34-year-old Stamford, Conn. woman. U.S. Marshals considered arresting Sanders at the wake on Monday, but "wanted to prevent having a spectacle" and did not want to disrespect the family, sources said. Sanders and Carey's family have argued that the dental hygienist suffered from postpartum depression and was unarmed when she led cops on a wild chase with her young daughter in her car. "They blew it," Sanders said of the D.C. police and federal officers involved in Carey's death. Judge Eisenberg, who works in Long Island's Eastern District bankruptcy court, ordered Sanders' arrest Oct. 7, saying she was "holding [Sanders] in civil contempt for his willful failure to comply with this Court's Turnover order." She added that she wanted Sanders "incarcerated in a federal facility until such time as [Sanders] has purged said contempt by paying." Sanders will be locked up until he not only satisfies the debt, but also forks over legal fees, expenses and interest. In addition, he'll have to pay $1,000 for each day he spends in jail, the judge wrote. Sources said the arrest order was almost unprecedented. Sanders made a career — along with his former law partner Jeffrey Goldberg — suing city agencies, particularly the NYPD. Most of his cases involved officers claiming they were victims of sexual harassment, discrimination or verbal abuse by police brass or fellow officers. The lawyers were known for alerting pet reporters to their court filings against the city — along with demands for exorbitant damages. Most cases, however, ended out of public glare with nuisance settlements which the city felt was less expensive than litigation. Ironically, Sanders and Goldberg split a few years ago after their firm lost the discrimination case to a female attorney who claimed she was fired because she had gotten pregnant. Sanders, who is married with a child, and is also a retired NYPD officer, stood with the Carey family, including Valarie Carey, a retired NYPD sergeant, at a Brooklyn funeral home on Monday. Last Friday, Sanders was on his usual rounds inside NYPD headquarters attending to legal matters involving a city officer, sources said. Sources said Sanders' arrest will likely lead to a disciplinary hearing, which could jeopardize his license to practice.